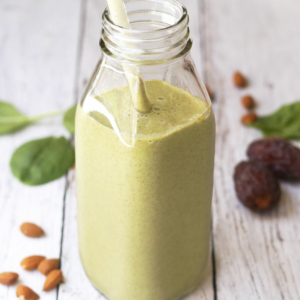 A sweet and creamy smoothie with a hidden dose of spinach! Combine everything, except for the ice, in a high-speed blender and blend until the ingredients are completely broken down. Add the ice and blend again until smooth. Serve cold! If you don’t have a high-speed blender, soak the chia seeds in the water overnight for easier blending in the morning.